Istanbul's bustling İstiklal Caddesi is chock-a-block with free art galleries sponsored by Turkey's biggest banks. The country's wealthiest families all have charitable foundations to go along with their gigantic, multi-industry holding companies. But is there such a thing as true corporate social responsibility in Turkey? 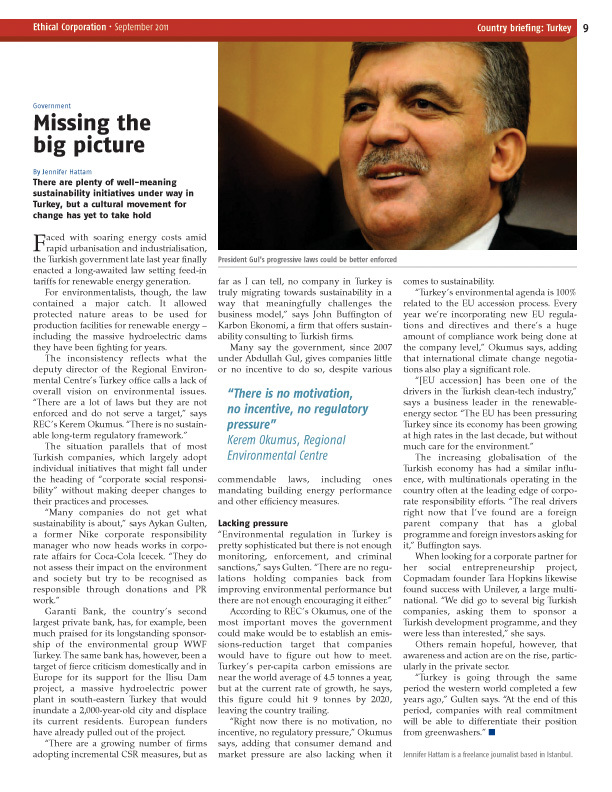 That's the question the sustainability consultancy One Stone set out to answer for a special country briefing on Turkey in the September 2011 issue of Ethical Corporation, recruiting me to contribute my local insight as an Istanbul-based correspondent. While other articles in the package looked at the need to move beyond philanthropy, the challenges facing leading companies, and the role of NGOs, I examined how the government and current legislation affect corporate responsibility. My conclusion? Turkish authorities, while making some promising steps, are missing the big picture.